No other brand of flame-resistant (FR) fabric or apparel protects professionals working in extreme conditions like CarbonX. With TPP and ATPV ratings far surpassing industry standards, CarbonX significantly outperforms similarly classified FR wear. 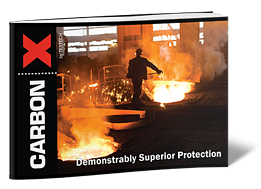 Learn more about the unmatched protection offered by CarbonX, as well as the material construction and performance by downloading a copy of our guide by filling out the form on this page.